The nine members of Concordia’s jazz choir, many of whom are not registered music students, crawled out of their shells and into character at their fall concert on Wednesday, Nov. 30. “The whole spirit of singing is contagious,” said Concordia professor Jeri Brown, who was inspired by the popularity of television’s Glee, sing-offs like American Idol, and the music department’s new downtown home to make this choir open to all university students. 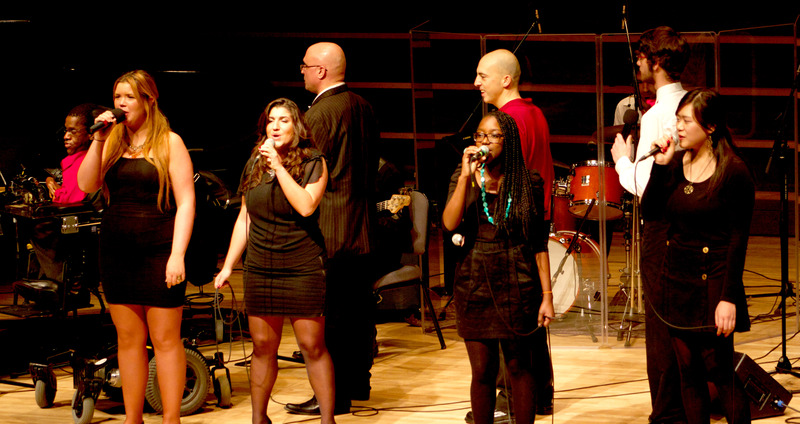 Brown is the director of vocal studies and has directed the jazz choir since its creation. In earlier years, it was available only to qualifying registered members of the music department. Brown said that it was a challenge and blessing to make the choir open to all students; it welcomed soloists and big personalities into an environment that aimed to blend many voices into one. According to first-year biology student, Cynthia Othieno, they’ve succeeded. “We have become a nice little unit of singers,” she said. “We perform spiritual work songs, pop and everything in between. All with jazz chord arrangements,” added Christian Brun Del Re, the choir’s percussionist, and a first-year drum performance major. “Jazz was the popular music of the 1920s, 1930s, and 1940s. Pop is currently the jazz of today. Not to include pop music in this choir would be a mistake,” said Brown. The choir performs songs with familiar lyrics but in new arrangements, accompanied by a pianist, percussionist, and bass player.